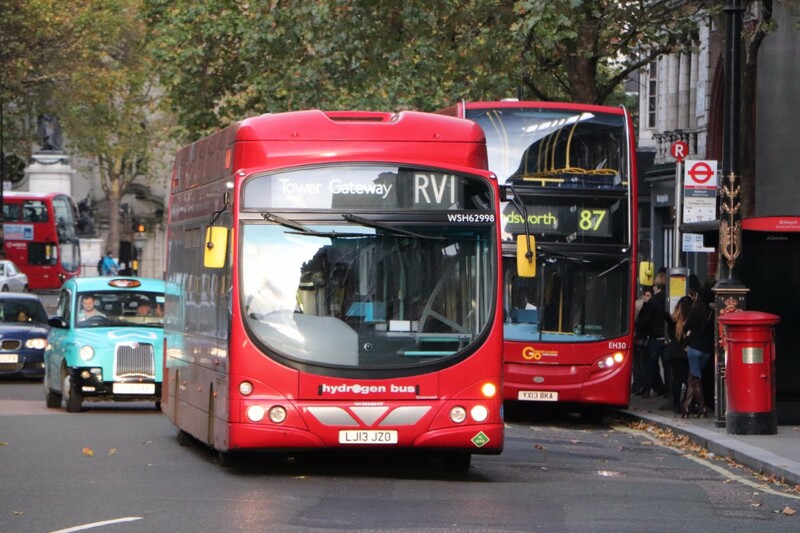 Bus-by-bus links: 411, 65, 65, 237, 190, 419, 220, 28, C3, 170, 137, 344, 88, 507, 453, 87, RV1, 388, 344, 42. If you suspect that catching buses over all the Thames bridges (well, almost) is an excuse for like-minded folk to spend a jolly day together you are not entirely wrong. 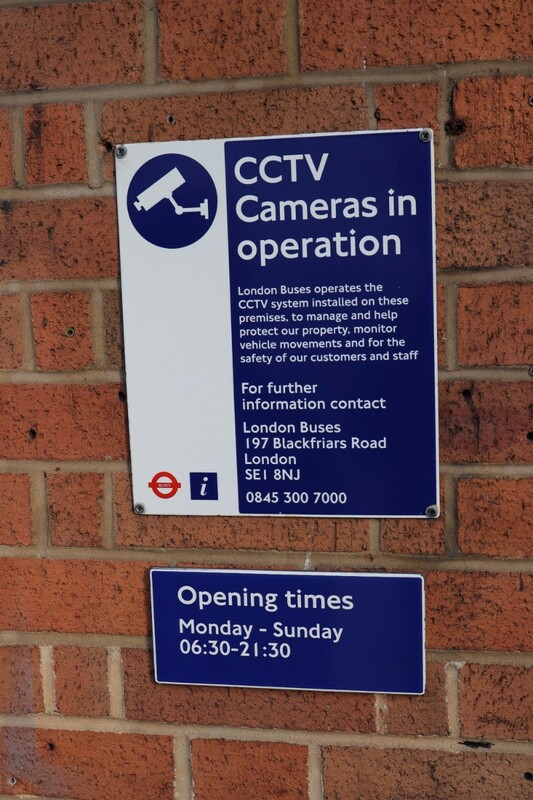 Yes, in some ways it is an odd thing to do, but it does provide an opportunity to get an overview of TfL provision from a user perspective and also throws up other insights into one of the most impressive transport networks in the world. On this occasion Bill was unable to be with us but in his place distinguished busman, Andrew Braddock and Reading Buses MD, Martijn Gilbert, came along for the majority of the proceedings. 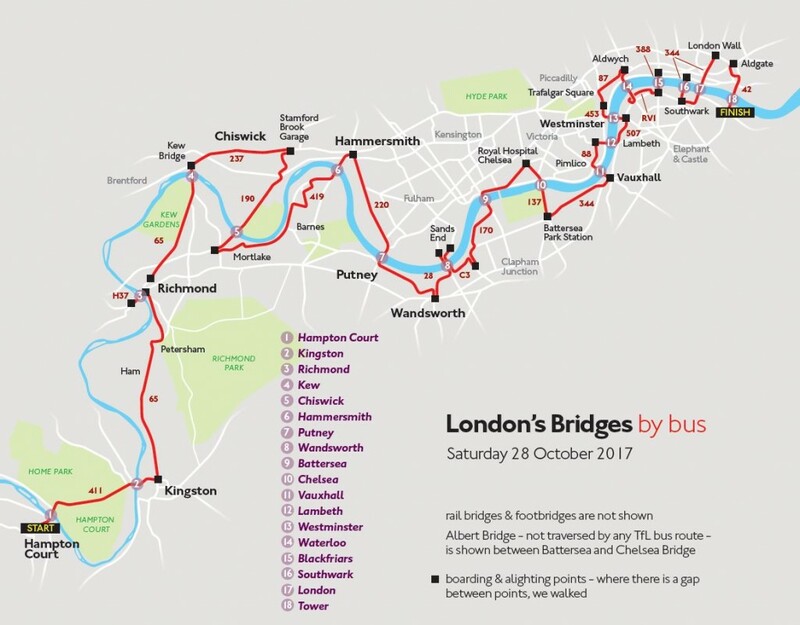 It was Roger who drew up the plan which originally envisaged catching a total of 22 buses to take us over the 18 qualifying bridges between Hampton Court Bridge and Tower Bridge. Would it turn out that way? – read on! 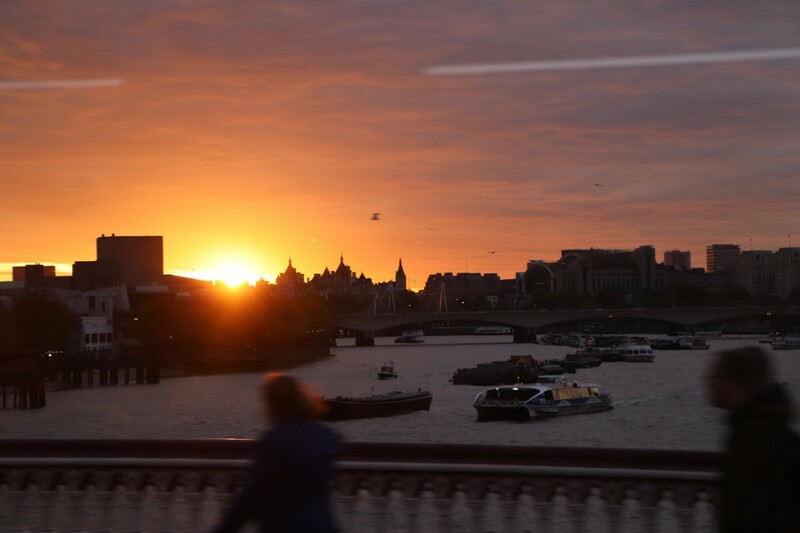 The day loomed but it appeared that the success of the expedition had been thwarted before we had even started when TfL issued a notice saying that Hammersmith Bridge would be closed to traffic from 5pm on Saturday 21 October to 5am on Sunday 29 October. Reading on from ‘here’s how your journey might be affected’ it said that ‘All buses which cross the bridge will be diverted or stop short of their normal destination. 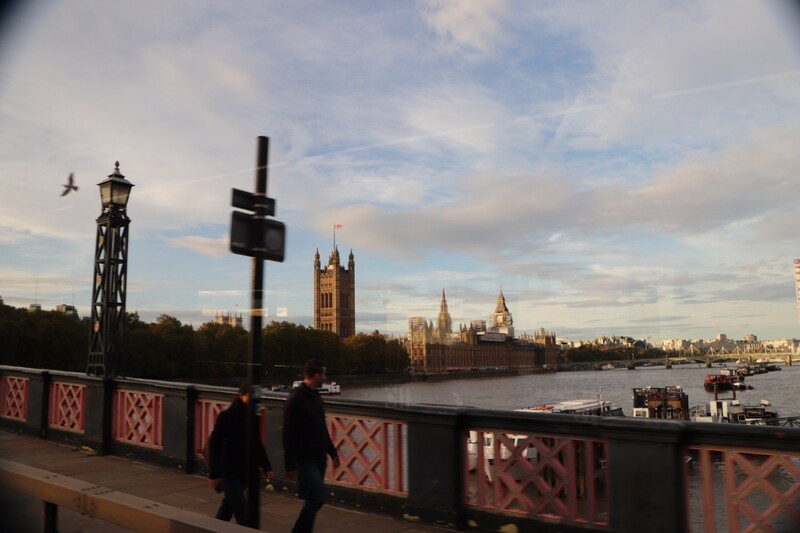 You can either walk across the bridge or use one of the diverted buses.’ Faced with no other option, walking across was what we were proposing to do, but then, on the eve of our departure, a further statement announced everything was back to normal. Obviously Palestra House had heard of our plans, we jested. 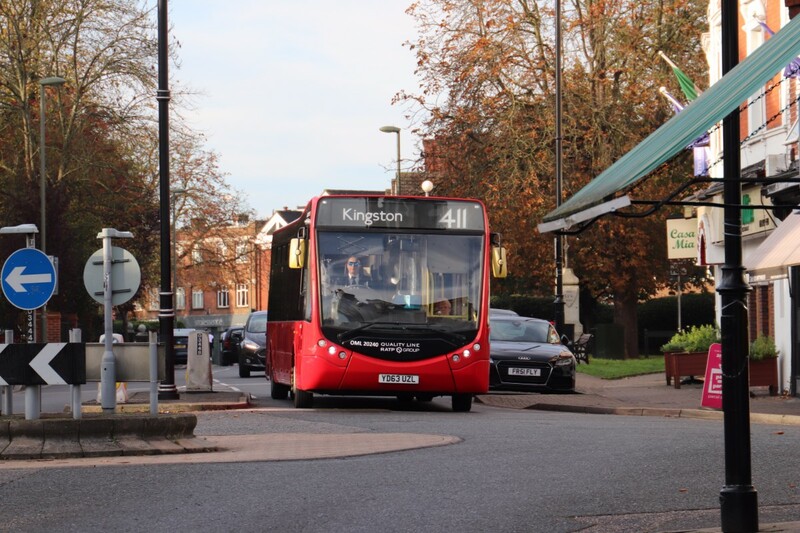 Our planned first bus was the 09.29 411 service from Creek Road, Hampton Court, the only time all day that we aimed for a specific bus because the 411 has a 20 minute Saturday frequency and all of the other routes we were to use were designated frequent services. The four of us (Martijn was to join us later) had all arrived in Hampton Court in plentiful time, courtesy of a South Western Railway Class 455 unit that still carried the Stagecoach livery Ray had designed for it, and had we had more presence of mind might have caught an earlier 411. As it was we went for a walk over Hampton Court Bridge in the still chill air of a sunny morning and watched the late-running earlier bus sail by. Roger had a brief conversation with a man paddling past on a sail-less sailboard before we ambled to the stop in time to catch our bus, operated by an RATP-Dev Quality Line Optare MetroCity, one of four vehicle types we were to see deployed on the 411 (Versa, MetroCity, Citaro and Enviro200MMC). Andrew was disappointed it wasn’t a Citaro (he likes them, especially articulated ones) but for me it was the first time I can remember travelling on the model. The back seat felt pretty hard and within a short distance all the windows other than the front and rear had steamed up but it took us over our first two bridges of the day, Hampton Court Bridge and Kingston Bridge. I learned from Ray that a house on the left had once been the headquarters of the Ian Allan publishing operation, their books empowering generations of spotters and in the process, I would argue, laying the foundations for the massive rail and bus preservation movement there is today. Oddly, although the bus was full and running late, it pulled up at the side of the road and stopped to ‘wait for a while’ to regulate the service. It makes no sense and puts the customer last. Alighting at Cromwell Road Bus Station at 9.44am we were reminded by Roger, for the first of many times during the day that toilets were available. The information office which had two signs saying it was open ‘Daily 06.30-21.30’ was closed, so we couldn’t get a copy of the area network maps we could see stacked inside. 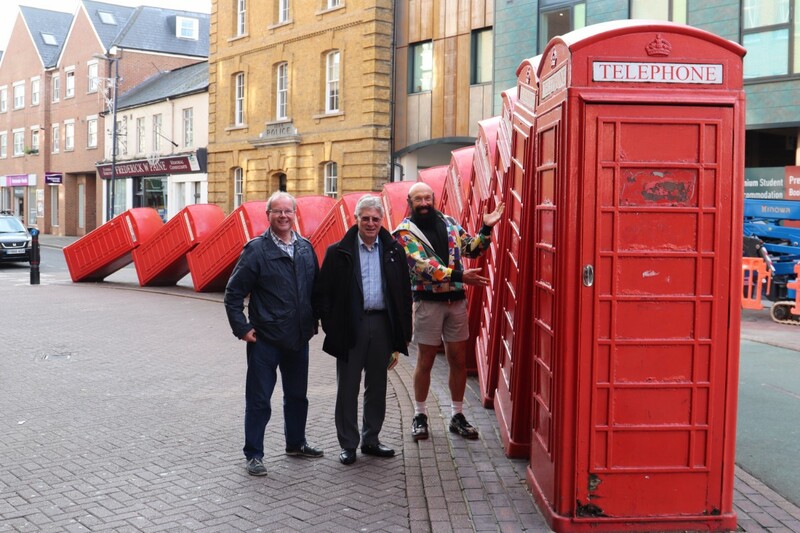 A short walking detour took us to see the famous ‘Out of Order’ artwork with telephone boxes apparently falling like dominoes, passing the former Kingston LT garage on the way amid much reminiscing about the noses of AEC Regal IV RFs poking out. We then boarded an RATP-Dev London United Scania OmniCity double deck for a lengthy trip on the 65 that crossed no bridges, though we did get a tantalising glimpse of Richmond Bridge, which we weren’t to cross until our next journey, on an H37 operated by the same contractor but this time using one of the relatively few Optare Tempos in London dating from 2011. After walking back over the bridge to take in the view, we were seduced by the coffee and cakes of Ole & Steen lagkagehuset, a Danish shop that issued queue tickets to customers. Over coffee Andrew revealed that he had once caused an earwig infestation of his parents’ home through storing semolina to represent grain in the silos of his model farm. Further consternation resulted when he filled in a Farmer’s Weekly coupon for a combine harvester demonstration and one turned up outside on the back of a low loader. The sales representative seemed undaunted on realising his potential customer was a ten-year-old schoolboy! 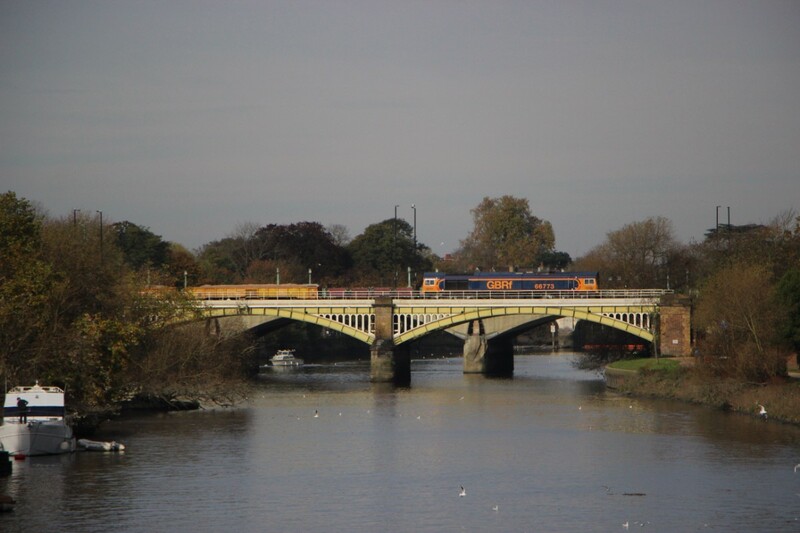 It was after we boarded another Scania OmniCity DD on the 65 over Kew Bridge to Kew Bridge Station that we realised we were all travelling on different tickets. I was using my special Year of the Bus Oyster card, Roger had a one day Travelcard including his train to and from Sussex, Ray had a London Council’s Freedom Pass (which entitles him to free travel on National Rail services within TfL zones 1 to 6 after 09.30) and Andrew had a Hampshire County Council ENCTS bus pass. When Martin caught up with us he also had a one day Travelcard. 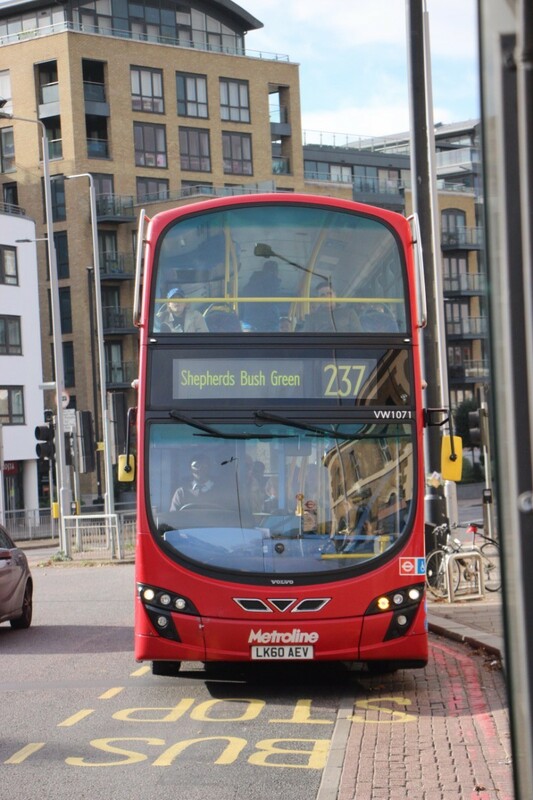 Next up was the 237 which we caught from Kew Bridge Station to Stamford Brook Garage, a Metroline route that was provided by a 2010 Wright bodied Volvo B9TL. Our driver announced that contrary to what the information screen and other announcements said (and continued to say) the bus was not going to White City, which was closed, and would terminate at Shepherds Bush Bus Station. Of note on the way was the site of the former LT Chiswick Bus Works which is now Chiswick Business Park. Once at Stamford Brook we alighted close to the garage premises. Although quite old, this has only been a bus garage since the 1980s as it was originally the power station for London United Tramways. We spent quite a while waiting at traffic lights and Roger mentioning this prompted Andrew to tell us that on route 38 between Victoria and Clapton Pond there had been 11 sets of lights in 1957 but there were now 42. With the i-Bus displays showing 11 minutes before the next 190, one surprised us by arriving. 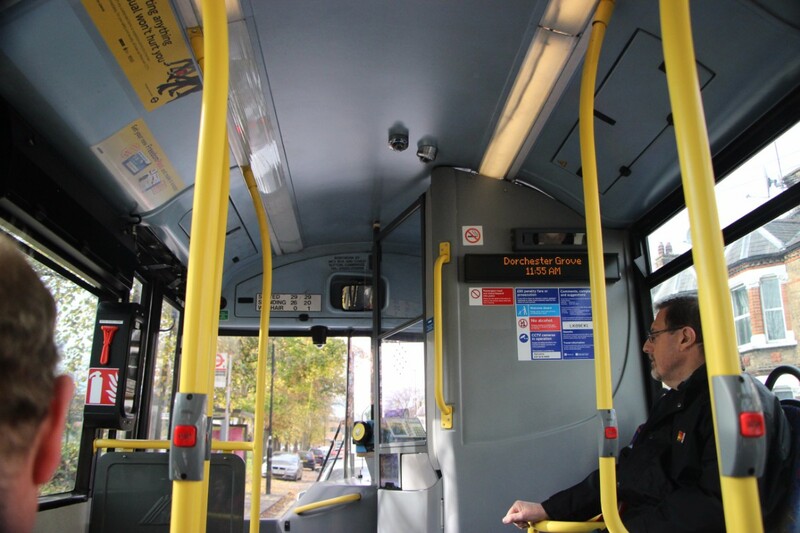 This was one of the unusual MCV bodied ADL Enviro200 chassis delivered to Metroline in 2009 and though the i-Bus screen on it was not registering when we boarded, it came back on shortly after we departed. It enabled us to cross Mortlake Bridge and pass the Hogarth Roundabout that has in its vicinity both the TESLA headquarters and Fullers, the last first-generation brewery within the Greater London boundary. 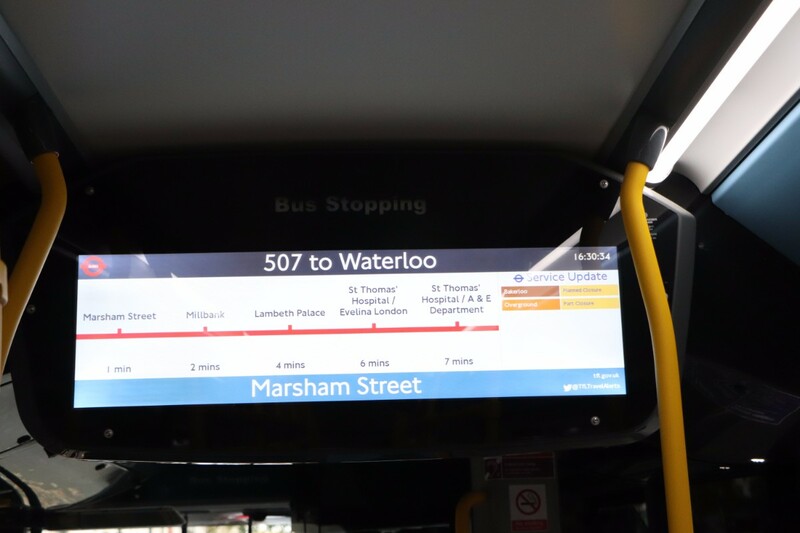 Mention of i-Bus displays is good cause to plug the various apps that were made use of. Roger was mainly using TfL’s own Next Bus information system, Ray was using the free CityMapper App which covers all modes and also shows where your next bus is located on a realtime map. Reference was also being made to the nationwide UK Bus Checker app and Open Train Times which, not only tells you when a bus is coming but will tell you its fleet number. As a plane flew overhead, Ray took it all a bit far by using PlaneFinder to identify it as BA218, a Boeing 747 arriving from Denver. Our choice for crossing Hammersmith Bridge to Hammersmith itself was the 419 which has an increasingly uncommon Hail & Ride section avoided by the more direct 209 service. Contracted to RATP-Dev London United, it produced the oldest bus we encountered all day, an 02-plate Plaxton Pointer bodied Dart SLF on which the i-Bus display was not functioning though the associated vocal announcements were. This was more than made up for by a broad welcoming smile from the driver as we boarded. 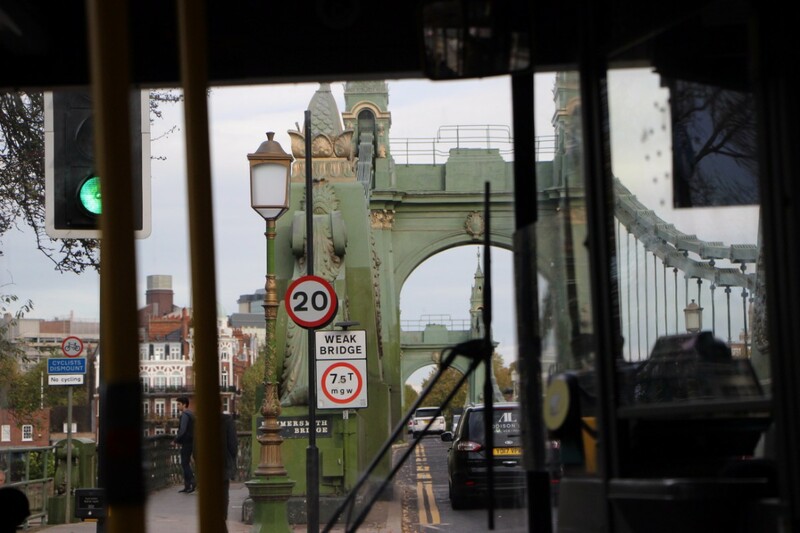 This was another journey on which we were told, ‘the driver has been instructed to wait at this stop for a short time to help even out the service.’ Weight limits on the Sir Joseph Bazelgette designed Hammersmith Bridge, a suspension type, dictate that only one bus at a time can use it. As we completed our crossing we noted two staff operating a manual barrier preventing a Versa travelling in the opposite direction until we were clear. Our carriage for the 220 over Putney Bridge, of University Boat Race fame, to Wandsworth was our first Enviro 400 of the day, an RATP-Dev London United example that had a line of condensation dripping from the very centre of the ceiling panel. 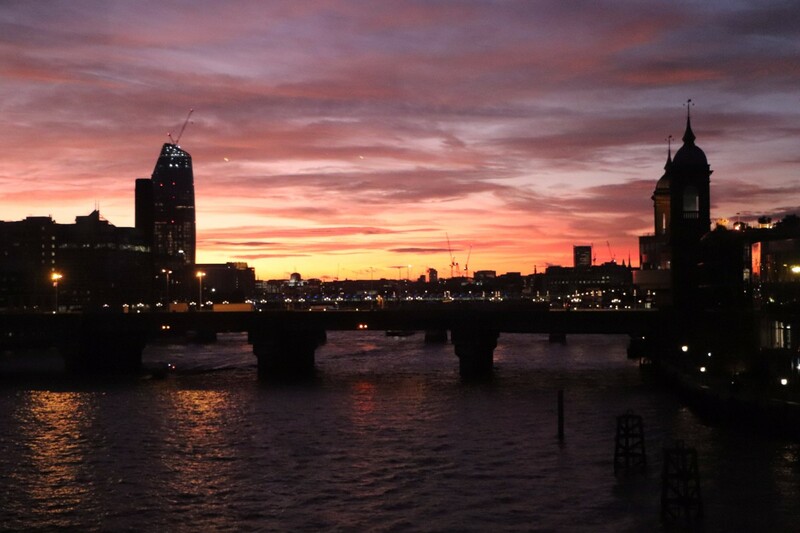 In conversation, Roger revealed he had recently undertaken another London epic, this one linking the most southerly and most northerly points on the TfL network. 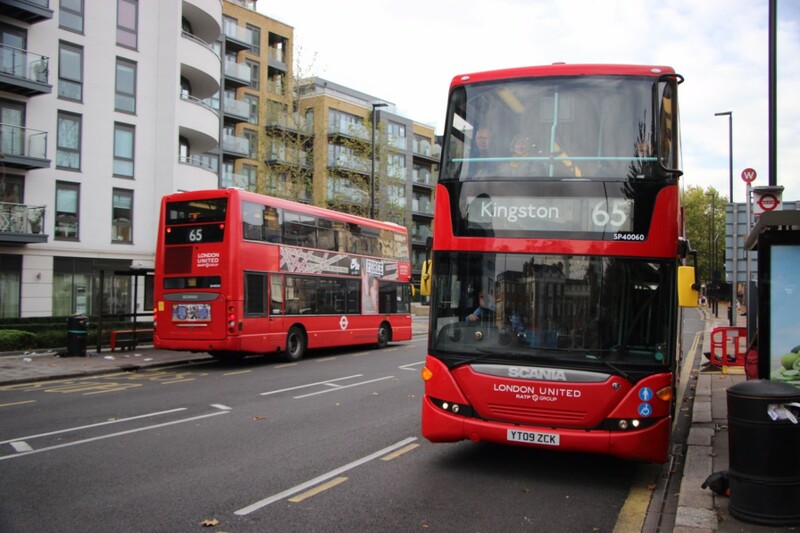 Starting from Dorking, it first involved taking the 465 to Kingston and the 65 to Ealing Broadway. Here he had intended to use the 112 and 232 before taking the 298 to Potters Bar, but with the 112 and 232 slow moving he took the 83 to Wembley,183 to Hendon, the 326 to Finchley Central, the 125 to Southgate and finally the 298 to Potters Bar Cranborne Road Industrial Estate. 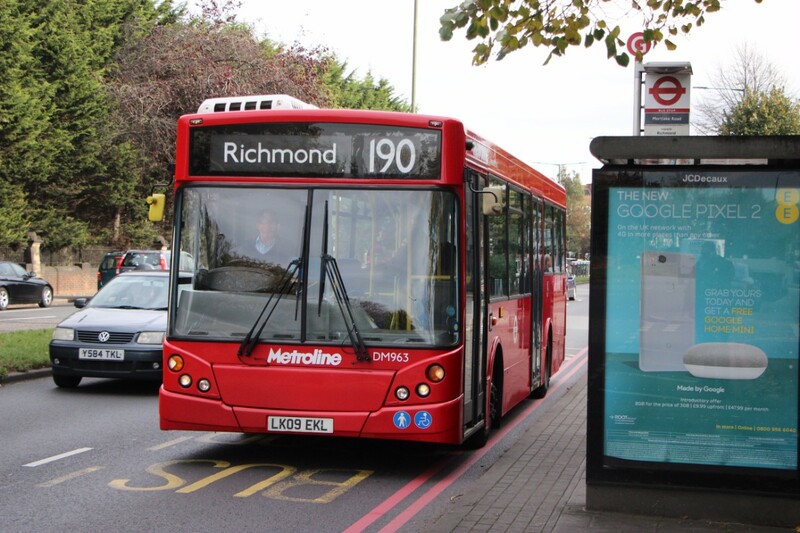 On 11 November an era will end when the 298 is cut back to Potters Bar Station because the last section is in Hertfordshire which is not prepared to subsidise it any more. 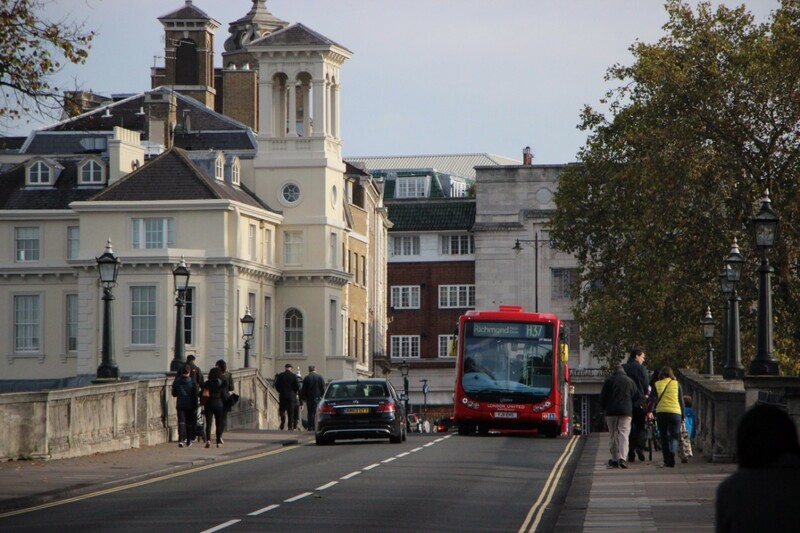 To take us over Wandsworth Bridge, our last before lunch, we caught a Tower Transit operated 28 worked by a Volvo B9TL Wright Gemini that had been new to First’s Centrewest operation in 2012. The attractive seat moquette appeared recently renewed though the main mouldings were still in First purple and surprisingly the stairway glazing panel still sported an etched First roundel. We had just missed the previous 28 but noticed that its driver had, having shut the doors, reopened them to assist a passenger who had appeared subsequently. 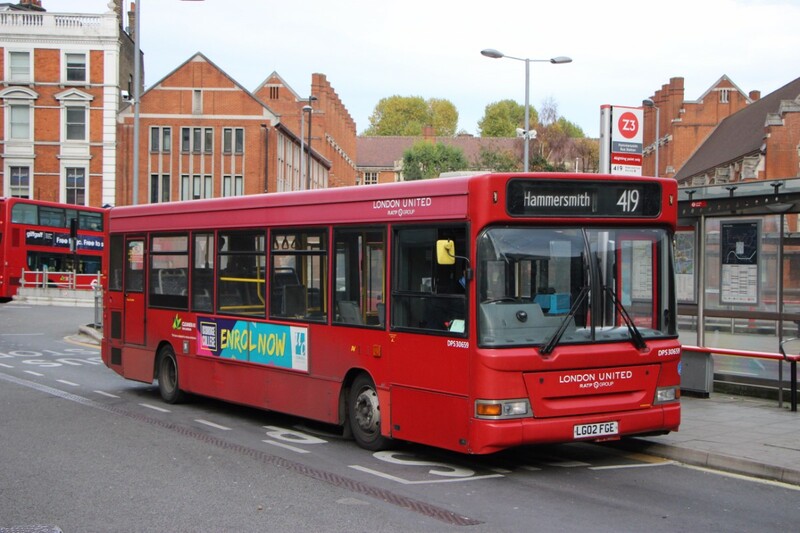 The route passed the Wandsworth depot of RATP-Dev’s The Original London Sightseeing operation. 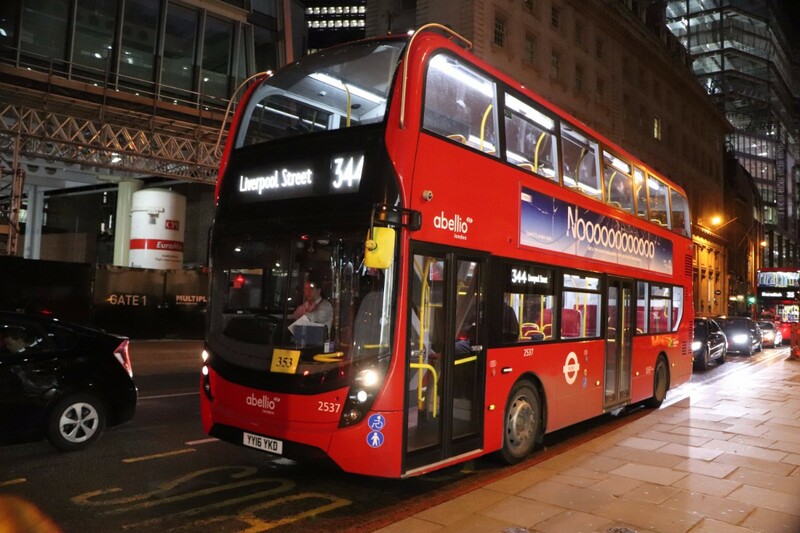 This had been known by LT as Jew’s Row back in the 1950s when it was the only one in London to house both trams and trolleybuses under the same roof, though they were parked separately. The sharing arrangement was ultimately bad for the trolleybuses and when trams went in 1952 the 612 trolleybus route became the first one switched to diesel buses with the entire depot converted to accommodate them. Alighting at Townmead Road in Fulham, it was a lengthy walk to the Sands End, which Andrew had identified as an ideal hostelry for lunch, where we met up with Martijn Gilbert. The time spent here, coupled with the lengthy coffee break earlier and other delays were making Roger’s aim of finishing in daylight increasingly unlikely so a rapid reassessment of the rest of the day’s proceedings was instigated. With stops for the C3 closer than retracing our way back to the 28 to continue as originally planned, Roger realised that if we abandoned the original plan, caught the C3 and doubled back over Wandsworth Bridge, we would be doing the remaining bridges from the opposite sides to those previously proposed. The main benefit of this was the ability to complete our crossings in the correct order rather than traversing London Bridge (south to north) prior to Southwark Bridge which we would have needed to do because the 344 only crosses it from north to south (it uses London Bridge in the opposite direction). 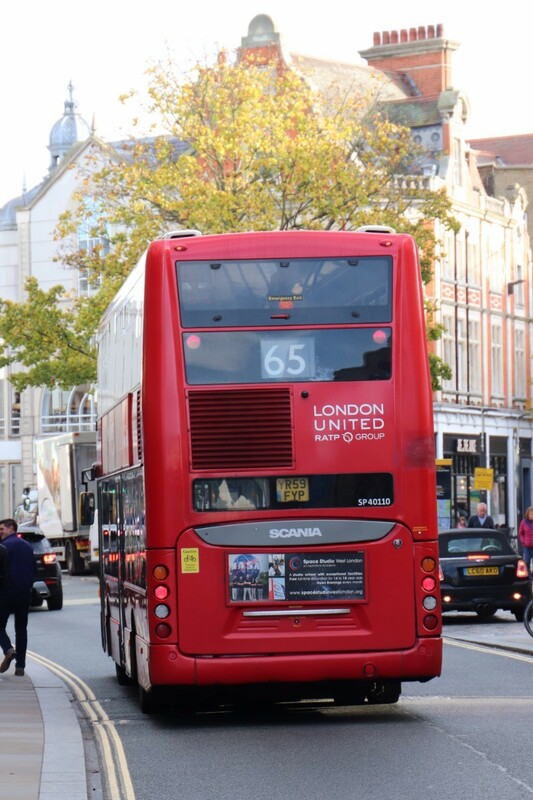 The rest of the day’s schedule was devised on the hoof using a variety of apps and Roger’s trusty London Buses Bus guide maps, although sadly and inexplicably these are no longer printed and those that remain available are increasingly out of date as they were published in March 2016. 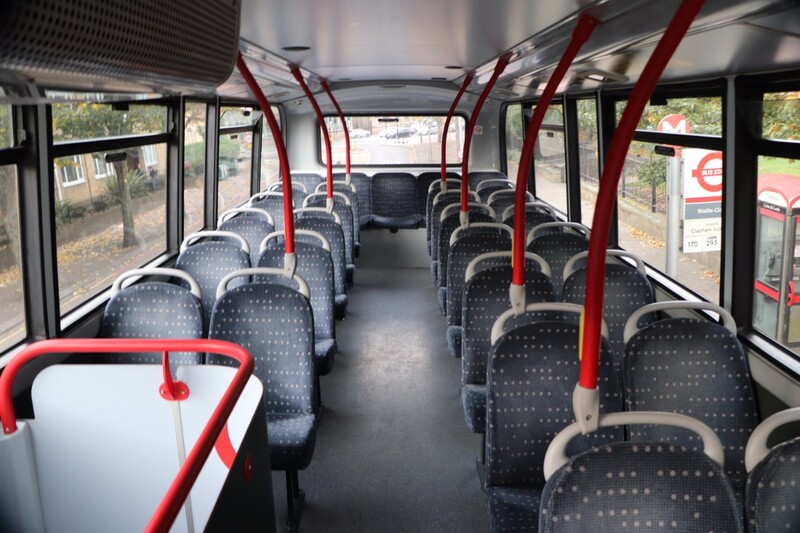 On our C3 departure Abellio was using a 61-plate ADL Enviro400 on which the upper deck legroom seemed especially generous. Alighting at Wallis Close in Clapham, we soon caught a 170 to the Royal Hospital in Chelsea crossing Battersea Bridge on the way. 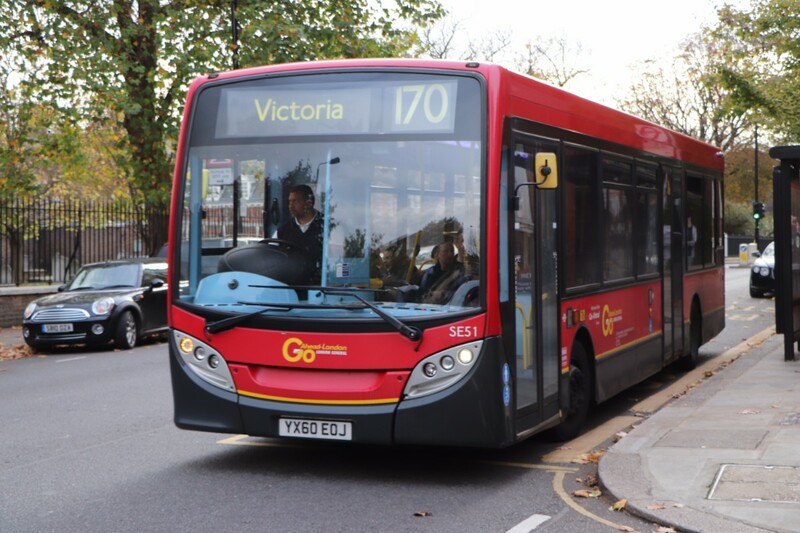 Our bus was one of Go-Ahead’s 60-plate Enviro200s. I found standing in the centre section an uncomfortable experience, not because of the ride but because you struggle to get out of the way of disembarking passengers at every stop. Those of the party brought up in London (everyone except me) was trying to reel off the old London garage codes in alphabetical order. It meant little to me but I did learn that there had been a depot with the same code as my initials; SJ was Swanley Junction. 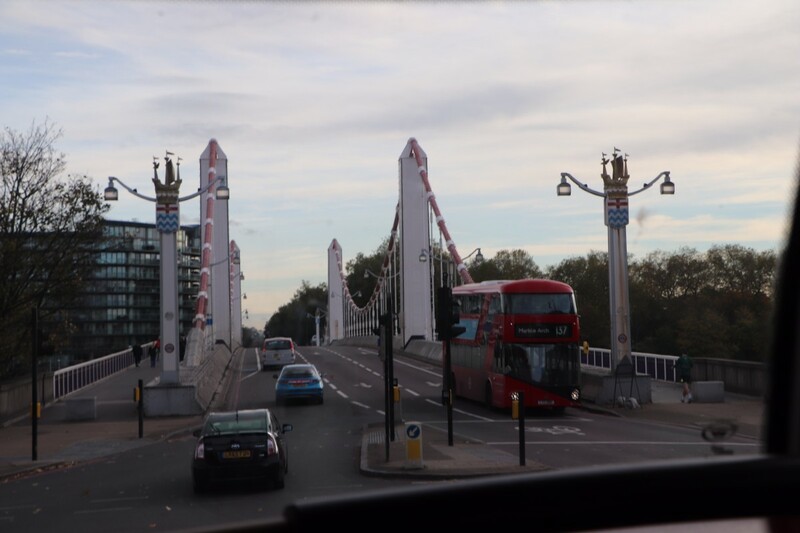 While on the 170 we passed Albert Bridge, which we thought may well have been the only one of London’s crossings (excluding rail and foot bridges) never to have had a bus service. It had a five ton weight limit from the late 19th century reduced to two tons in 1935. Sir Peter Hendy CBE must have been monitoring our progress as Roger was reporting it on Twitter. 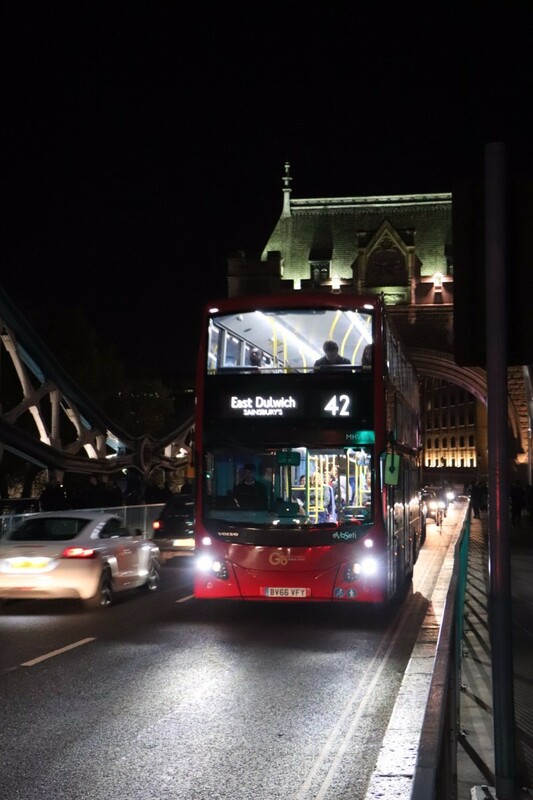 The former Commissioner of Transport for London and current Chairman of Network Rail intriguingly tweeted that he’d been over Albert Bridge in a bus! Our first journey of the day on a New Bus for London (not that anybody calls them that) was also our only Arriva journey. We were impressed that the flat area behind the front upper deck windows had recently been polished. 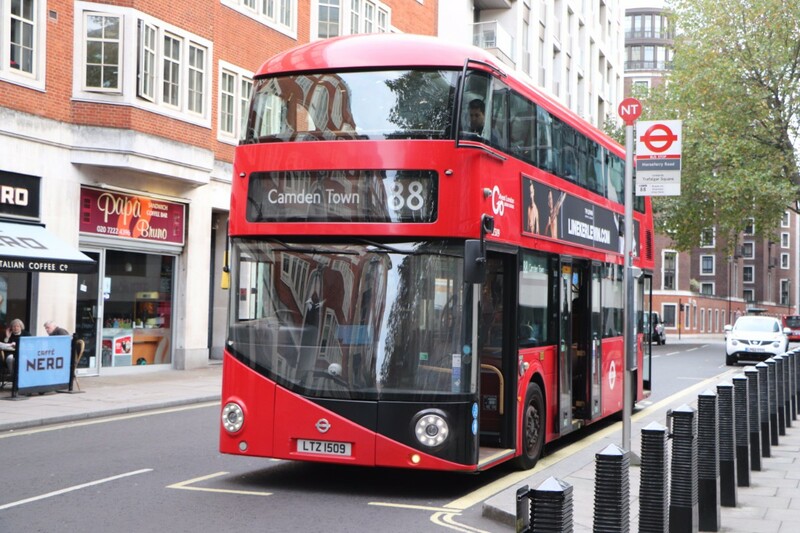 The 137 took us over Chelsea Bridge to Battersea Park Station. Noted passing in the opposite direction was one of the Wright Crusader hybrids used on the 360 service which are soon to be replaced with ADL/BYD electric e-Buses. 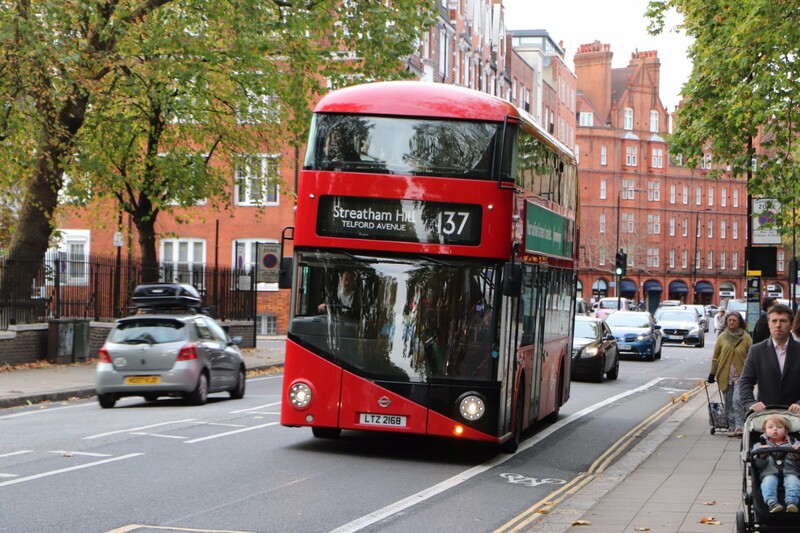 Getting off the 137, Ray recalled that this was where he had first seen FRM1, the rear-engined Routemaster. Roger pointed out that a passing 436 was listed on the bus stop post but not the map as it had been introduced since it was printed. 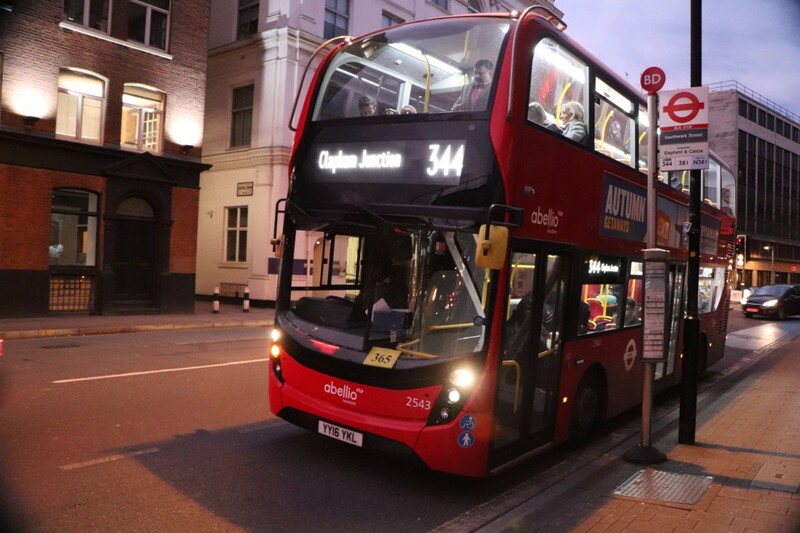 We were destined to make three separate journeys on the ADL E400MMC Hybrids used by Abellio to run the 344, the first of which was our next one, taking us to Vauxhall Bus Station. Here, among many other buses, one of the Wright Volvos repowered by Vantage was operating on the 87 in the opposite direction to us. We watched it pull silently away and hoped another would appear for our next journey. 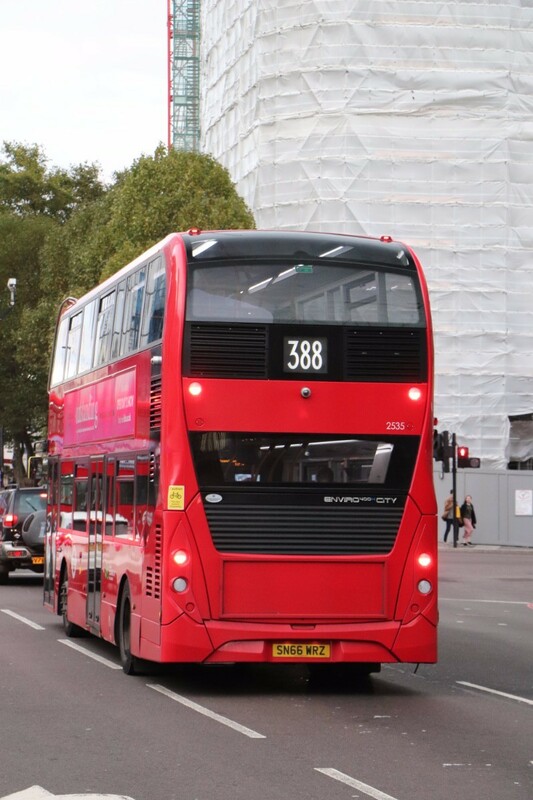 With the minutes ticking away we opted instead to catch the 88 over Vauxhall Bridge, another Borismaster, though this time a Go-Ahead example. 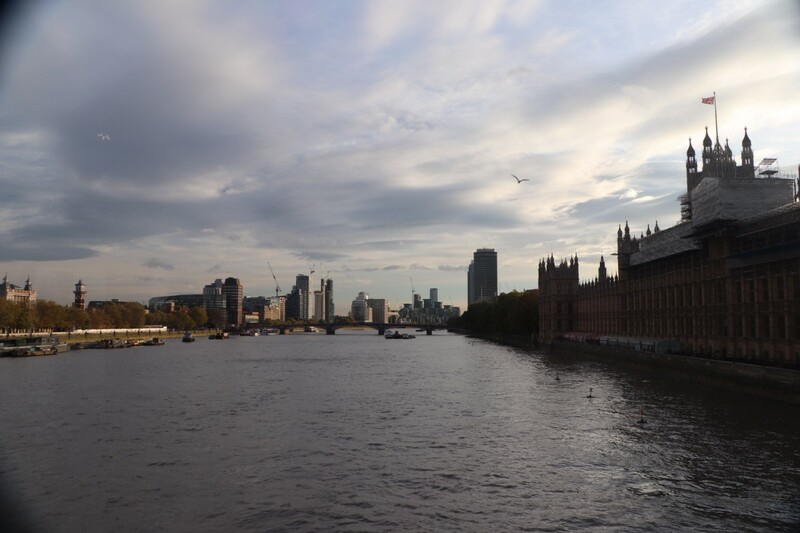 It seemed that as we progressed the bridges got closer together and our time on board buses decreased, certainly the amount of notes I was taking reduced noticeably, and this was particularly the case from Lambeth Bridge onwards. To cross it we took the 507 and one of the Waterloo based ADL/BYD eBuses. It exhibited excellent take-off and was massively quieter than the early all-BYD buses I have travelled on at Schipol Airport several times recently. Also impressive was the large Navaho screen i-Bus display, though the 507 is a slightly odd choice to fit USB points on as passengers are rarely on it long enough to make plugging in worthwhile. Roger commented that this was our first 500 series route number which I thought nothing of at the time. Noticing that our journey involved travel on services within every block of 100 numbers I raised the meaning of this with him later. 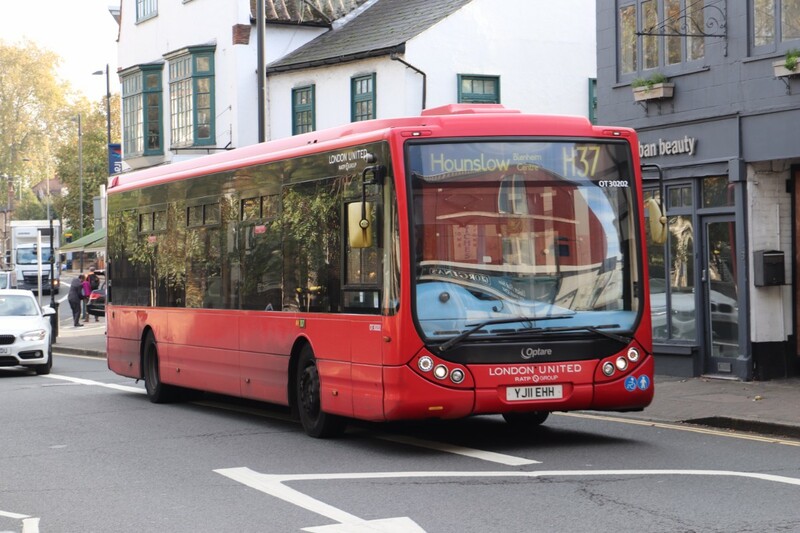 Currently, 1-500 (plus 507/521/549 and 607) are day routes, 600-699 are school services, 700-899 are coach services and 900-999 are mobility services (though there are now only two, the 965 and 969). Letter prefixes other than N (night) and X (express) are local services with the letter relating to the main local population centre. The system was different in the past when, for example, 500-699 were trolleybuses, 300-399 were routes in the country area north of the river, those in the 400-499 band were corresponding services south of the river and there were some 800 routes serving the New Towns. Noting all the new pedestrian defence measures in place on Westminster Bridge (and many others) we crossed on the 453, another Go-Ahead London General Borismaster, staying on board as far as Horse Guards Parade where we switched to an ADL Enviro400 from the same fleet on the 87 as far as Aldwych, positioning us nicely to catch the RV1 over Waterloo Bridge. 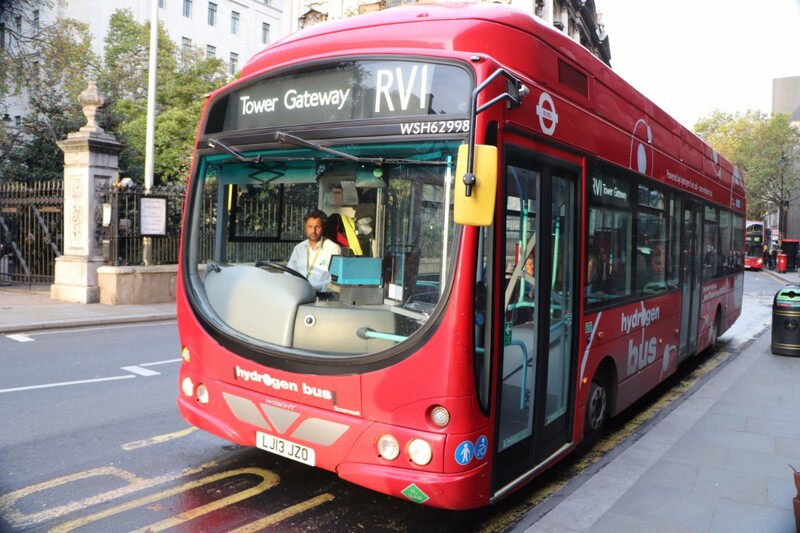 Operated by Tower Transit, the distinctive hydrogen-fuelled buses on the RV1 were built by Wrightbus on VDL SB200 chassis and fitted with ISE equipment and Ballard fuel cell stacks. These were jolly expensive buses (each said to have cost a seven figure sum) and though you can hear the compressors they are quiet. They also seem to sway more than conventional buses and have unusual all red seat trim. Alighting at Blackfriars Road and looking for a bus to take us over Blackfriars Bridge Roger had identified the 100 as meeting our needs from the map. It was mentioned on the bus stop timetable display and timings were given but did not appear on the pole so we let a 388, that appeared soon after we got there, go past while we waited for the 100. After a while with no sign of a 100 Roger determined using his phone that the 100 had been curtailed and the 388 extended to replace it earlier in the year. Checking the details on this via the internet revealed that in the necessary consultations more people had been against the changes than supported them. In the end we caught a 388 operated by CT-Plus using ADL Enviro400 City deckers and as soon as it had crossed the bridge it was diverted, though there were no details available of where to. 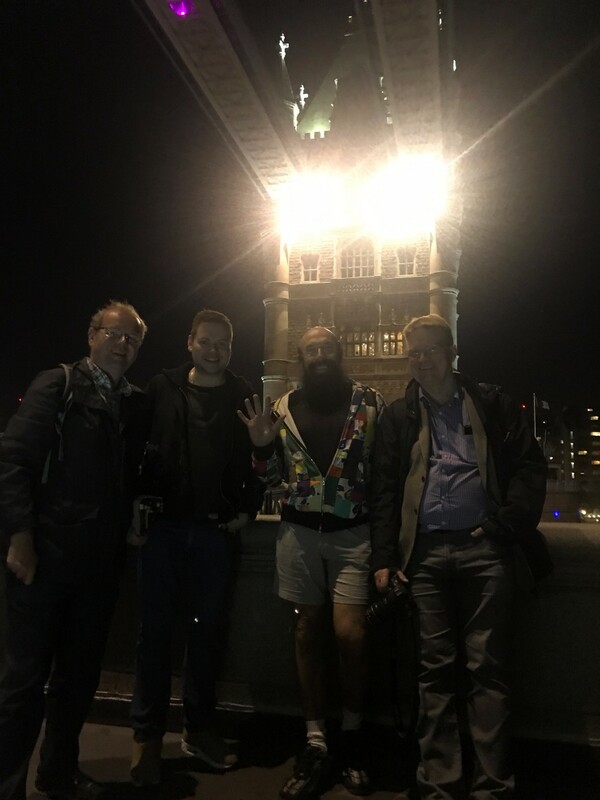 Rather than fall further behind schedule we decided to walk to the north end of Southwark Bridge for our next crossing. It was at this point that Andrew left us and headed home to keep a promise to be there in time for dinner! Benefitting from our earlier change of banks (of the river) we were, after our walk, able to catch another of Abellio’s ADL Enviro400MMC Hybrids southbound over Southwark Bridge and another northbound over London Bridge, both of which afforded great views as the sun set, alighting at Wormwood Street and walking to St Botolph Street in Aldgate. Though the clocks did not go back until the early hours of the following morning, it was already fully dark when our final bus of the day, an MCV EvoSeti bodied Volvo B5LH hybrid belonging to Go-Ahead London General hove into view on the 42, heading for East Dulwich Sainsburys. As soon as we could after passing between the towers we disembarked for some celebratory photos and a walk to Tower Hill Underground station to begin the journey home. We had done it, crossing all 18 bridges on 22 buses in around nine hours including breaks. There is always a serious side to our jaunts and this one demonstrated much that was good with transport in the capital, particularly how easy it is to use from a ticketing standpoint, the generally high standard of the vehicles and generally good infrastructure. It was a cause of some disappointment to me that the one driver that actually said hello as I boarded later shot a red light when he could easily have stopped, but overall staff demeanour and the standard of driving was good and at a rather higher level than I suspect many detractors could muster if faced with London traffic all day. There are continuing deficiencies in information provision. This is not only in the lack of up to date printed material, but also in failings in the satellite linked systems that cause them to drop off the apps and could twice have caused us to miss buses.